Summary: A lower priced rowing machine from Body Sculpture (less than half RRP currently at amazon.co.uk). This has 12 resistance levels and is light enough to move around easily. Keep in mind the 100kg max body weight for use. 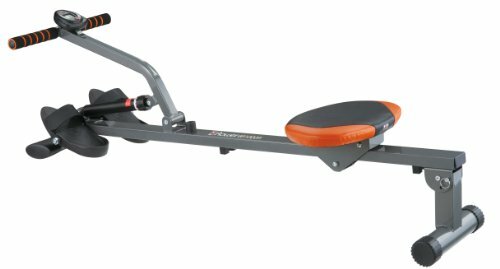 Would make a great starter rowing machine, if you enjoy this one then you can always move up to one of the amazing water rowers later. The body sculpture BR1000 rower makes working on a budget no problem at all. At a very reasonable price this model gives an incredible body workout as the motion of rowing exercises every major body muscle group, a popular option among one of the most popular fitness machines! This is a light machine and while it might be argued to not be the sturdiest of machines, the 13kg machine is easy to move around the house and position it wherever fits you best. It’s easy to assemble and allows you to save room when not in use by folding it and storing away. It has 12 (Dial-A- Tension) resistance levels which allow you to set the degree of resistance you desire. Lower resistances help you warm up and you can gradually increase the levels to push your body further. The adjustable incline can also be used to increase the intensity of the workout as the higher the degree of incline, the harder you have to row. The LCD monitor helps you visualize any adjustments you make and be able to track your progress and theoretically monitors how many calories you have lost depending on how many strokes you’ve made per minute, time taken and speed. Adjustable footplates are to ensure good ankle support regardless of the height of the user although on this machine people above 6’ might struggle to get the full pull length. Under the saddle is a 6 wheel carriage that is important for the stability of the body sculpture rower to ensure it doesn’t tilt unnecessary and cause you injury. The wheels also provide smooth motion while working out and the body sculpture BR1000 rower is relatively quiet while in use. This one has a big discount over at amazon.co.uk (at the time of writing) and some solid user feedback too – check out the product page now and see it for yourself. This home gym rower is a great bargain at the price it retails for and yet serves the user well. However, those over 100kgs would need to get another machine as this is not sturdy enough and would not support the extra weight. Despite it having 12 resistance levels, those extremely fit individuals would not find it challenging enough. For them I would suggest the Hammer COBRA XT rower which has much better resistance for those intense workouts they would want.